Adam Kaufman is a Boston.com sports columnist who also serves as national and local talk show host and anchor on the CBS Sports Radio Network, 98.5 The Sports Hub, and WBZ NewsRadio 1030. At the Sports Hub, the Syracuse grad hosts the weekly "Celtics @ 7" NBA show on Saturday mornings and handles C's studio host responsibilities for game coverage. Believe it or not, he's a really positive person. 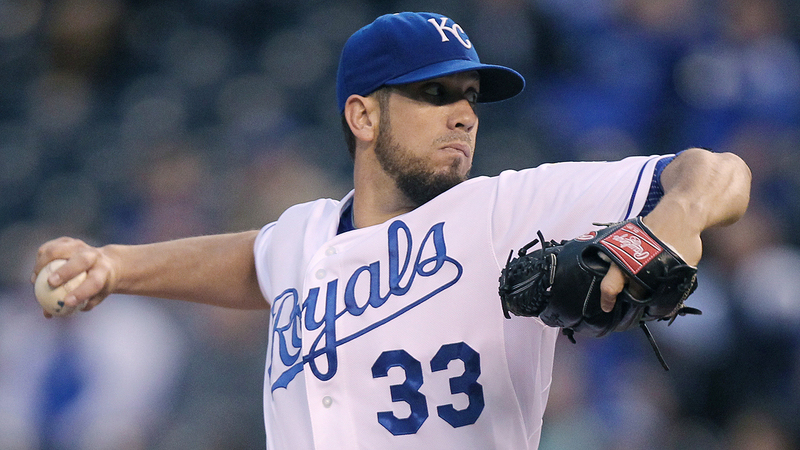 I can�t believe I�m saying this � maybe I�m still thawing out from all the shoveling and my brain isn�t quite functioning rationally � but the Red Sox should have signed James Shields. According to SB Nation�s Chris Cotillo, the free agent pitcher has reached a four-year deal with the Padres worth in the range of $72-$76 million. The contract is also said to include a club option for a fifth season, and is pending a physical. Let�s get one thing abundantly clear: At 33, Shields is not an ace. The �Big Game James� moniker is and always has been completely laughable, especially when noting the veteran�s 3-6 record and 5.46 ERA in 11 career postseason starts. Last year, his playoff ERA ballooned to 7.00 over two World Series starts; both losses. However, Shields is undeniably an experienced and dependable top-of-the-rotation regular season starter. Since 2011, spanning two years with the Royals after a pair with the Rays, Shields is 58-39 with a 3.17 ERA and 1.16 WHIP. Dating back to 2007, his second year in the majors, he�s never started fewer than 31 games or pitched fewer than 203 1/3 innings. In fact, the righty has averaged 223 frames, while twice earning Cy Young and MVP consideration. Moreover, Shields has generally pitched well against the AL East, showing a 3.52 ERA versus the Orioles, a 4.15 ERA when facing the Yankees, and a 1.29 ERA in limited action matching up against his former team from Tampa. If you�re curious, he�s struggled mostly with Boston, posting a 4.37 ERA. Short of performing in the playoffs, he�s been reliable in a difficult league and in a division with some imposing bats. In the wake of losing Jon Lester to the Cubs in an otherwise active offseason, the Red Sox are slated to boast what could be a very solid five-man rotation when spring workouts begin later this month; hopefully significantly better than the vast collection of arms that finished 26th in the game with a 4.36 ERA in 2014. New additions Rick Porcello, Wade Miley, and Justin Masterson will join 2014 holdovers Clay Buchholz and Joe Kelly to form a group with average career stats but promising ceilings. In other words, every man in that group would be considered a third starter at best � maybe a second � in most rotations across baseball. Admittedly, that�s true of Shields as well in some of the game�s elite rotations, but in Boston he�d easily slide into the top spot and, compared to what some expected him to earn (as much as $110 million), the ballpark $18-$19 million a year is reasonable for his services. After all, old friend Jake Peavy just got $12 million per season. Recognizing Shields� lack of postseason prowess and ownership�s desire to stay away from high-priced pitchers in their 30�s, especially, as in the case of Shields, one with so much mileage on that right arm, Red Sox general manager Ben Cherington may still have a move up his sleeve. Boston has an abundance of outfield talent and major league-ready (or close to it) prospects the GM could deal in exchange for a veteran and superior hurler to Shields, such as the Phillies� Cole Hamels � provided Philadelphia backs off on its rumored demands for Blake Swihart. Most fans aren�t enamored with Shields, so it�s hard to imagine the better-educated baseball brass inside Fenway is either. There�s no sense in settling if Cherington feels there�s a realistic option still on the table with the season rapidly approaching. In fairness, the Sox may also be alarmed by Shields� career 2-9 record and 5.42 ERA in 13 starts at Fenway. The Red Sox are banking on big years and bounce-back campaigns from their new-look rotation. Porcello has steadily improved in each of his last five seasons, as his ERA has lowered from 4.92 to 3.43 and his starts and innings have climbed from 27 to 31 and 162 2/3 to 204 2/3, respectively. The 26-year-old is coming off his best season with the Tigers, but he still trailed the likes of Max Scherzer, Justin Verlander, and David Price in Detroit�s rotation. Currently, he looks like Boston�s Opening Day starter. It�s safe to say most know what to expect from Buchholz at this point. He�ll probably never touch 30 starts or 200 innings in a season. At one time or another, he�ll take a turn on the disabled list. There is a potential bright spot, though; the veteran�s success dating back to 2009 has routinely come during every other season. Consider the 30-year-old�s ERA and start totals over the last six years: 2009 (4.21, 16), 2010 (2.33, 28), 2011 (3.48, 14), 2012 (4.56, 29), 2013 (1.74, 16), 2014 (5.34, 28). If you look at that pattern closely, Buchholz tends to pitch better when he�s doing it less, which means he could be in line for a better-than-average ERA over a sparing number of appearances. Like Porcello, Miley�s an innings-eater. Unlike his new teammate, the 28-year-old has trended in the wrong direction of late. The former Diamondbacks hurler has averaged 32 starts and 200 innings the last three years, but his win-total has decreased from 16 to 8 as his ERA has risen from 3.33 to 4.34. Now armed with a three-year extension, the Sox may be banking on Miley to turn things around in his first season in the American League. That brings us to Masterson, a reliever during most of his two years in Boston early in his career, but a starter more often than not with Cleveland over parts of the six years since. The 30-year-old was an All-Star in 2013 and posted one of his two seasons in which he displayed an ERA in the low-three�s, but the seven-year big leaguer has typically been as his career-averages indicate: A middle-of-the-road pitcher. Last year was horrific for Masterson; the worst of his career. Splitting time between the Indians and Cardinals, the righty went 7-9 with a 5.88 ERA and 1.63 WHIP in 28 appearances. More than any other member of the rotation, it�s a wonder if Masterson will wind up in the bullpen by season�s end. Kelly is still a question mark. The 26-year-old was 6-4 with a 4.20 ERA in 17 starts last year, though a bit better after a trade to Boston, when he went 4-2 with a 4.11 ERA in his 10 trips to the mound. In his brief three-year career, though, Kelly has a 3.44 ERA as a starter to go along with a 3.25 ERA in 30 outings in the �pen. Each of Boston�s projected starters is capable of having a strong season, but they�ve all spent time on the other side of the spectrum in recent years as well. Cherington may also believe some of his younger arms are primed to take on bigger roles in the event of injury or ineffectiveness by one of the aforementioned place-holders. Whether it�s in the spring or at the trade deadline in several months, I�m inclined to go with the first of the above options. Pitching wins championships, and I�m not confident the Red Sox have what they need, despite their 14-to-1 odds to win the World Series (tied for fourth-best), according to Vegas Insider. It shouldn�t come as any surprise the Sox didn�t make an aggressive push for Shields, since Cherington told media members at the Boston Baseball Writers Dinner last month he likes where the team is at in terms of the rotation, but that doesn�t mean it�s the right move. Now, he�s off the table and the Red Sox continue to be left with a rotation lacking in any sort of consistent track record for success. As for Shields, this is a smart and convenient move. The Padres had an eventful offseason and are much-improved after adding Justin Upton, Wil Myers, and Matt Kemp, and the pitcher already makes his home in San Diego. He can give our best to Will Middlebrooks. Follow me on Twitter at @AdamMKaufman and email me here.